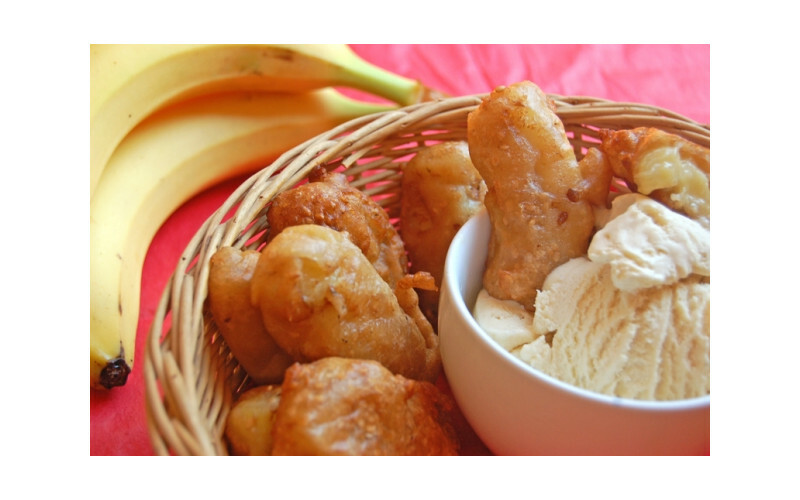 Chinese Banana Fritters make a truly scrumptious vegetarian and vegan dessert. 1. Preheat the oven to 150°C/300°F/Gas Mark 2. 2. Sieve the flour and sugar into the mixing bowl plus salt and five spice powder. 3. Add the liquid a little at a time until a smooth batter forms. 4. Add the sesame seeds and mix in by hand. 5. Heat about half to an inch of oil until very hot – drop a tiny drop of batter or water into it to see if it sizzles. If it does, it’s ready. 6. Dip the banana pieces in the batter and fry in small batches (about 4-6 pieces at a time) until golden brown and crispy – too many will cool the oil and make them soggy. 7. Keep each batch warm in the oven while you fry the rest. 8. Serve with a dusting of sieved icing sugar and accompaniments of your choice, as below.